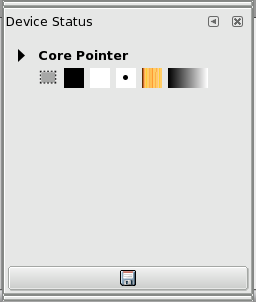 This window gathers together the current options of Toolbox, for each of your input devices: the mouse (named “Core pointer”) or either the tablet, if you have one. These options are represented by icons: foreground and background colors, brush, pattern and gradient. Excepted for colors, clicking on an icon opens the window which lets you select another option; the tool-box will be updated when changing. You can drag and drop items to this dialog. The “Save device status” button at the bottom of the window, seems to have the same action as the “Record device status now” option in the Input Devices section in preferences. From an image menu : Windows → Dockable Dialogs → Device Status.